The Convention of the Episcopal Church in East Tennessee meets annually to conduct the business of the diocese. It elects diocesan leaders; ratifies a budget; accepts resolutions; hears the bishop’s annual address, handles business related to diocesan entities, and in the year before a General Convention, it elects a deputation to General Convention. It is also a family gathering of folks across our diocese. Clergy and elected delegates participate in our convention – visitors and exhibitors are welcome!. 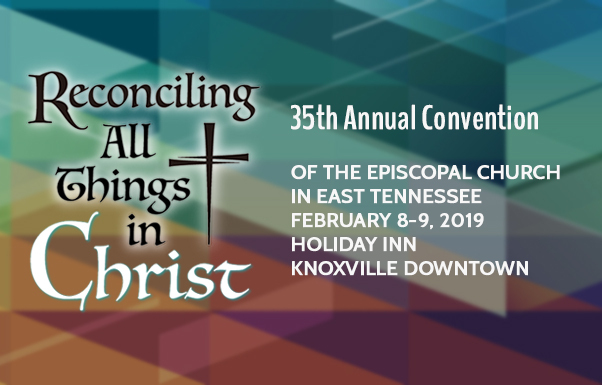 The 35th Annual Convention of the Episcopal Church in East Tennessee #ETCON19 will take place on Friday, February 8 and Saturday, February 9, 2019 at the Holiday Inn Knoxville Downtown. Thursday, February 7, David Burman will be ordained as a transitional deacon at St. John’s Cathedral at 7 pm. Your presence and prayers are invited! We’re in for a huge treat Friday evening, February 8 – Nashville Songwriters in the Round: John Tirro, Sam Gay, Templeton Thompson, and Sally Barris will be in concert! All the details about the convention may be found on the 2019 convention web page.